In a continuing effort to support California State Parks “Crumb Clean” initiative, Web of Life Field (WOLF) School is introducing new practices for the summer 2016 camping season to further educate visitors and protect wildlife at Little Basin Cabins and Campgrounds. WOLF School is headquartered at Little Basin, part of Big Basin Redwoods State Park in Boulder Creek, CA. 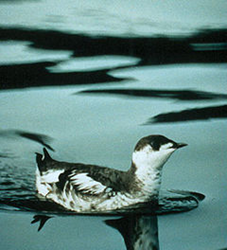 By going “Crumb Clean,” Little Basin is reducing the raven and jay populations to natural numbers, giving the endangered Marbled Murrelet a chance to once again flourish high atop the redwood canopy. WOLF School’s trained naturalists will attend the California State Parks’ annual interpreters’ training for the 2016 summer season, and WOLF School has designed programs to educate Little Basin visitors on the Marbled Murrelet and the California State Parks “Crumb Clean” campaign. Little Basin campers will sign a Crumb Clean Commitment, WOLF School’s Little Basin interpreters will hold educational talks and campfires geared towards adults and children, and as a keepsake every visitor can take their photo with the new Marbled Murrelet mural painted by WOLF School’s Terra Dawson, which scientifically illustrates this remarkable species and captures the impact of California State Parks “Crumb Clean” initiative.